Are You Ready for a Rock-Steady RV? Stops Unwanted Chassis Movement. Like a rock-solid race car chassis, JT's Strong Arm™ Jack Stabilizers use triangles — the strongest shape in nature — to eliminate unwanted chassis movement. One end of each stabilizer tube attaches to each landing gear leg and the other to the RV frame, forming a rigid triangle. There is no welding required and no need to remove and reattach during setup. It's permanent! When parked, JT's Strong Arm™ Jack Stabilizers telescope into place with the jacks. The patented universal system is designed to attach to the three main types of jacks found on RVs: scissor, front landing gear and telescoping. Easy Installation on All Types of Jacks: The universality and versatility of JT's Strong Arm™ Jack Stabilizer is remarkable. Using a unique system of brackets, the Strong Arm™ attaches to any of the three main types of jacks found on RVs: scissor, electric and telescoping. By using the proper clevis and swing bolt, JT's Strong Arm™ Jack Stabilizer attaches to and stabilizes any of these jack systems. Make Your RV Rock-Steady: No one wants a home that shakes, wiggles and waggles, especially a "home away from home", your RV. JT's Strong Arm™ Jack Stabilizer virtually eliminates all unwanted movement using race car suspension technology and the power of triangulation. Make your RV rock-steady with JT's Strong Arm™ Jack Stabilizer! Order your system today! Coaches with scissor or telescoping jacks in the rear. Easy to set-up: telescopes into place when jacks are lowered, all you do is tighten the "T-Handles"
I say Rock Solid for both the product and your RV after installation. I have tried many different stabilizer products over the years with limited success, the JT Strongarms are second to none! After installation my 40' Fifth Wheel experienced zero shake. Even when moving about in the bedroom/overhang. Installation was straight forward and well documented. I researched several stabilizer system and am very happy that I chose the JT's. They were easy to install and work great. Great product and very high quality. Installed this kit on my a 32' Denali 5th Wheel. This addition has made a significant improvement to the trailers stability. Glad I bought it. Would definitely recommend it to a friend. A little pricey but does the job! Wife had heart attackes everytime the wind blow and if there was a storm she cried and cried. 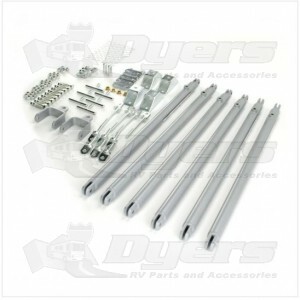 Know the I bought the JT's RV Jack Stabilizer System For 5th Wheel RVs she has been more relaxed. It does not totally stop all the shaking but to that would be impossible. At least if there is bad weather or the winds pick up I can now sleep because the wife is not going crazy. Easy to install. Met all my expectations. "All" shakes & clunks stopped. Quict to set up. No more tri-pod!